You’ll of course notice that there is something added into the above graphic that wasn’t there in the original cover picture. That would be the names and birth/death dates of these ones. Yep, that’s right. Every one of these brothers and sisters is dead. From a purely human viewpoint, it could appear that these developments could hardly take place before the generation of 1914 disappears from the scene. But fulfillment of all the foretold events affecting the generation of 1914 does not depend on comparatively slow human action. Jehovah’s prophetic word through Christ Jesus is: “This generation [of 1914] will by no means pass away until all things occur.” (Luke 21:32) And Jehovah, who is the source of inspired and unfailing prophecy, will bring about the fulfillment of his Son’s words in a relatively short time.—Isaiah 46:9, 10; 55:10, 11. The Watchtower recognizes the truth as belonging to Jehovah, and not to any creature. The Watchtower is not the instrument of any man or set of men, nor is it published according to the whims of men. No man’s opinion is expressed in The Watchtower. 8 Similarly today, a Governing Body composed of spirit-anointed Christians contributes to the unity of the worldwide congregation. The Governing Body publishes spiritually encouraging literature in many languages. This spiritual food is based on God’s Word. Thus, what is taught is not from men but from Jehovah.—Isa. 54:13. In this time of the end, Christ has committed “all his belongings”—all the earthly interests of the Kingdom—to his “faithful and discreet slave” and its representative Governing Body, a group of anointed Christian men. (Matt. 24:45-47) The anointed and their other sheep companions recognize that by following the lead of the modern-day Governing Body, they are in fact following their Leader, Christ. It seemed to be a good angle at the time. I certainly delivered it with sincerity and believed it. It makes me think of what Pontius Pilate asked Jesus. He said: “What is Truth”? If this wasnt so replusive and sickening, it would be sad. I agree with Jon, this is “repulsive and sickening” and it is VERY SAD. I, sad to say, believed these lies too. 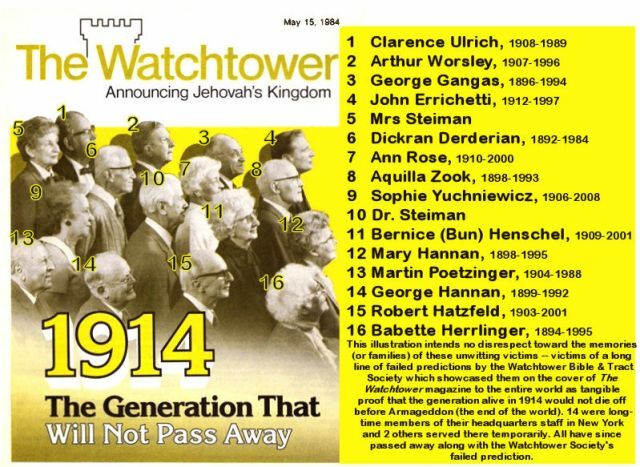 Simply put, the GB/JW-org, Jehovah’s Witness’s are false prophets. Christ warned us about them. The GB are men that teach lies and then try to cover them up. They even have blamed the flock for believing them in the past. Like the 1975 failure. I can’t remember exactly what they said but they put the blame on the flock for believing the end would come in 1975. They make themselves equal to Christ. What is truth? Jesus Christ is the TRUTH. He is the only way, the only door. I have been polluted by the Watchtower teachings and I am trying to gain an real TRUTH. I believe the WT has stunted my growth. I don’t know. Maybe it is all my fault. I can read, I can pray and Christ warned us. It’s not easy being a JW all your life then finding out what they really are. I prayed not to believe in any lies and God answered that prayer. Now getting my life right with Christ and his father is my goal. I am not even sure if I know what a real Christian is, who they are, where they are or if I am one. I just don’t know. All I know is JW’s are false prophets and I, many, have been lied to and mislead. This was hardly the “Creator’s promise”. Now the Society is pushing the bizarre overlapping generation theory. When this came out I just had to shake my head in disbelief. I couldn’t believe that afterward some brothers were excited about the “new light”. I would have thought the Society had learned their lesson by now. I guess I was wrong. Greybeard, I feel your anger and pain. I have bouts of sadness and a sickness that goes right to my core, when I think of the GB. They are truly a bunch of charlatans. I remember giving exactly the same presentation. I was a young pioneer, eager to please. I WAS SO SURE. Oh well….. However, the R&F have been duped and mislead and upto a short time ago I guess we all were. Therefore our bile should be directed at only the leaders, who have been so conniving. Like Jesus he condemned the leadership of his day, but for the R&F Jew he felt pity. Likewise, the old little sister, or single mum or whoever are only trying to do their best, so not lets be so hard on them. The time is approaching, when we all will be put to the test, every man, woman and child on this earth and then we will surely know who is for Jesus and who isn’t. LOGIC: If you start with the wrong date you’ll end up with the wrong answer. 1914 was an important date–the expiration of the Gentile lease of power, thus their eviction began with WWI and continues to this day (Luke 21:24). However, 1914 was not particularly relevant to the parable in Matt. 24:32-34, which is called “the parable of the fig tree.” Most students of the Bible realize that the fig tree represents the nation of Israel (Jer. 24); so when did Israel symbolically “put forth leaves”? Hindsight is 20/20–they got statehood in 1948. Now use your Psalm 90:10 scripture and start adding. I’ll add 70 years–for various reasons. The internet is destroying what is left of this CULT. While other faiths are difficult to prove or disprove one can easily PROVE that the Jehovah’s Witness is a false CULT using their own writings. The CULT will continue to collapse from within till the only people in the seats are those who are computer illiterate. Matthew 24 v 15 & 34, You have to identify the Disgusting thing in Daniel 11 v 31b & 12 v 11, and what this Holy Place is; first, before discernment is possible.